Clementine and her pet parent, Janice Baldwin-Hench, walked into an assisted-living and Alzheimer’s facility in Dover, DE, and as Janice signed in at the desk, a voice nearby asked, ‘”Oh could you bring your dog over here? She’s adorable.” Clementine’s new “career” was about to begin. Read the story in Janice’s words. This little dog’s future hadn’t always seemed so clear. Her pregnant birth mom had been dropped off at an animal shelter. When Clementine was eight weeks old, she was transferred to Animal House Rescue in Mechanicsburg, PA, and placed in foster care. Her information was posted on Petfinder. 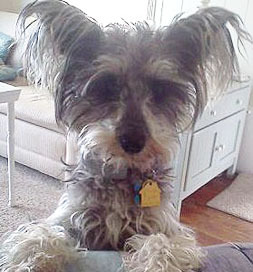 Janice saw the listing and gave her a forever home when the Poodle/Schnauzer mix was just 12 weeks old. She soon enrolled the pup in classes where she received her advanced degrees: Canine Good Citizen and certified therapy dog. Clementine was now set to become an active therapy dog, and on this first visit, Janice was a bit nervous. She thought she might need some conversation starters, so she had practiced some with her husband. But, as it turned out, Clementine was the only icebreaker needed. “It was dogs all the time,” Janice says. “I heard about dogs who worked family farms, herders, hunters and ratters who lived in the barns. I heard about a favorite Beagle named Louie.” The residents missed their pets, and Clementine brought back fond memories and encouraged the people to recall them. A dream of having a therapy dog had occurred to Janice in 2011, before she had adopted Clementine. She herself was in the hospital for surgery and was missing her pets. Now, here she was with Clementine and a group of seniors, singing enthusiastically. Janice couldn’t help but feel gratified.